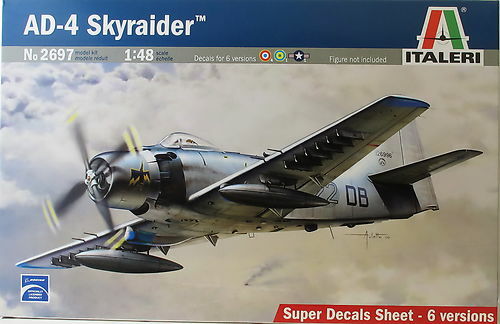 The Douglas Skyraider was manufactured immediately after War World II. Despite its traditional piston motor, in an age when jets were spreading, the Skyraider had an extraordinary long career. It made its first flight in 1945 and it was retired from service only in 1975. It has participated to several conflicts, demonstrating its value in Korea and in Vietnam. Characterised by low speed manoeuvrability, it was able to transport impressive war cargos of over 3,500Kg. Perfect for ground attack missions, it was provided with robust armour to minimise fire damages from the enemy. France used more than 100 Skyraiders, many of which took part to the Algerian war, replacing the old T-6 Texan as insurgency aircraft and close support. Before going definitely out of service, several Skyraiders were sold to Air Forces of the former French Colonies, such as Chad and Gabon.